When driving along Georgia Street, I decelerate near the Thurlow intersection. With hands firmly on the wheel, windows rolled down, I gaze out at a palatial structure, admiring its size and glittering chandeliers, hoping to detect the delicate, bergamot scent, escaping from its doors. From Shangri-La’s plush foyer washrooms to its unrivaled $20M+, two-story penthouses (complete with internal elevators and lap pools), the luxury hotel truly is in a league of its own. Here are six reasons why you’ll fall in love with everything this landmark building has to offer, as I have. 1. Market by Jean-Georges, located within Shangri-La, is the absolute perfect date spot. Not only is its seasonal menu entirely to die for, each of its four dining areas — including the firelit Georgia Room and the heated, intimate patio — are comfortable, elegant backdrops. 2. 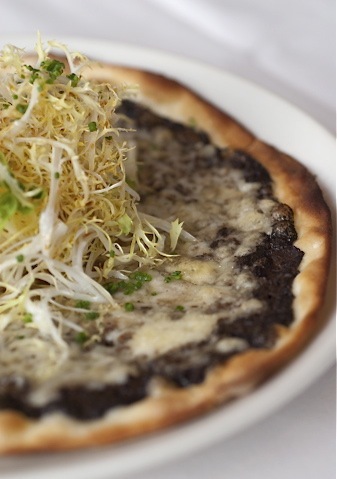 Black Truffle Pizza is bold-flavored, ultra rich, and entirely deserving of its spot on Vancouver Magazine’s list of Best Things To Eat and Drink In Vancouver. Add it to your bucket list. 3. Tuna Tartare, with its tangy ginger dressing, is creamy-textured, slightly spicy, and goes down incredibly easily. You’ll want three. 4. Desserts are fun, creative, and irresistible. The Salted Caramel Sundae with Candied Popcorn and an Ovaltine Kulfi with Caramelized Banana and Spiced Milk were favorites. View Market’s brand new dessert menu here. Can you tell these creations are made by a woman? Chef de Cuisine Karen Gin does not disappoint. 5. Jay Jones, Market’s Lead Bartender, is arguably Vancouver’s best mixologist. With years of experience and a slew of awards under his belt, Jay’s inventive cocktails complete the perfect dining experience at Market. you’re greeted at the door to the moment you leave — feeling as if you’re floating — tranquility, peace, and comfort engulf you. I recommend the 1hr 50 min ‘Yin Yang Harmonizing Massage’ that ‘harmonizes and pleasantly balances the flow of universal chi within using deep rhythmical strokes’. It did just that, and was without a doubt the best, most stress-relieving massage I’ve ever received. Chi is open from 9am to 9pm allowing those working late to visit after a long, stressful day. You can follow Shangri-La on Twitter here and Market by Jean-Georges on Twitter here.